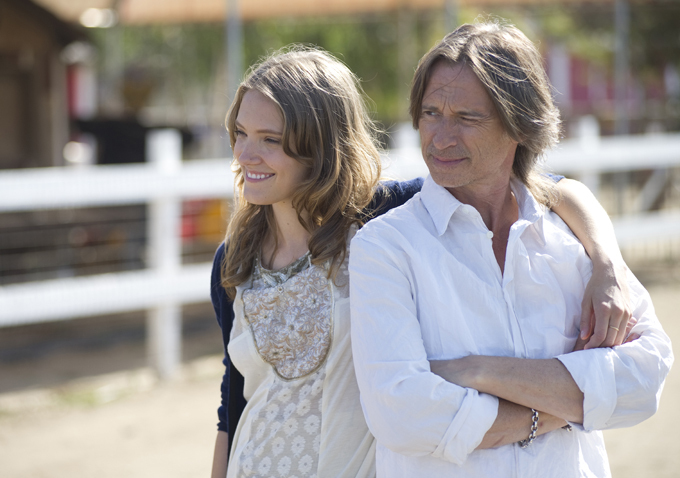 The ever dependable Robert Carlyle, usually relegated to playing a supporting character, gets a chance to show off his leading-man chops in the indie “California Solo,” a recent best-narrative-feature winner at the Woostock Film Festival. In the drama from Marshall Lewy (“Blue State”), Carlyle plays Lachlan MacAldonich, a washed-up, middle-aged rocker who is working on an organic farm, mostly with undocumented Mexican workers. One night, Lachlan gets pulled over while driving drunk and a prior drug offense puts him in danger of being deported. In a last-ditch effort, Lachlan must prove that his deportation would cause extreme hardship to a spouse or relative who is a U.S. citizen, forcing him to reach out to his estranged family to get them on his side. Below Lewy shares a scene from the film with Indiewire. Strand Releasing opens “Califonia Solo” Friday, November 30. “California Solo” was inspired by some of the great performances of the character-driven dramas of the ‘70s and early ‘80s: Paul Newman in “The Verdict,” Dustin Hoffman in “Kramer vs. Kramer,” Robert Duvall in “Tender Mercies,” to name a few. Great films built around amazing performances, these leading men wore the films like a well-tailored coat (by the way, “Alice Doesn’t Live Here Anymore” is an example of one centered around an incredible female lead). I wrote “California Solo” with the Scottish actor Robert Carlyle in mind, an actor I felt could do wonders with a custom tailored coat of this sort, cinematically speaking. Carlyle doesn’t disappoint, and the scene I want to talk about lets his acting ability live in perhaps the most stripped-down way. The scene is little more than Carlyle and other actors in a bare room. It occurs about thirty-five minutes in, shortly after Lachlan MacAldonich (Carlyle) has received the good news that the deportation problems that started with a DUI are mostly over…or so he thinks. He arrives at the probation office expecting a little red tape, nothing too bad, but instead he finds himself detained by an Immigration and Customs Enforcement (ICE) Officer. It’s really two scenes – first, Lachlan is interviewed by the ICE Officer, played by Patrick Gallagher with a mix of unspoken compassion and bureaucratic indifference; and second, a consultation in the same room between Lachlan and his two lawyers (Robert Cicchini and Brad Greenquist) who he’s pissed at – they’ve failed miserably to keep him out of legal trouble. The scenes are simple by design – they literally take place in a room with nothing but white walls, actors sitting across from each other at a table. We chose this bare room to create the sense of the legal and existential vacuum Lachlan has entered. The DP James Laxton and I decided to shoot the scene handheld, and to cover it with unusual angles to convey Lachlan’s unease at this unexpected detention. James lit the scene with harsh overhead fluorescent lights, and they give Carlyle’s face hard edges. I have worked with plenty of actors who would have objected on the basis of this unflattering light alone – but Carlyle doesn’t care about that kind of flattery. He only wants what’s best to convey the character, and the light creates a landscape of emotion on his face that I could watch for hours (and I did, in the editing room). The scenes didn’t take us long to shoot, mostly because the actors were so on their game. It was one of our last shoot days, so we’d found our rhythm as a cast and crew, and the dialogue and dynamic of the scene worked from the moment we started shooting it – I often like to tinker with the dialogue of a scene on set or the night before, but in this case I didn’t have to. The stakes were clear, the emotions all sprang up immediately. Also, it’s in this scene that we learn for the first time that Lachlan has a teenage daughter he is estranged from. This is the piece of information that drives the rest of the movie. The moment he reacts to this is priceless to me – his humanity piercing through the unfeeling bureaucracy. Yet he doesn’t even know her exact age anymore. “Fourteen…I think.” A three-world line of dialogue that conveys so much history.